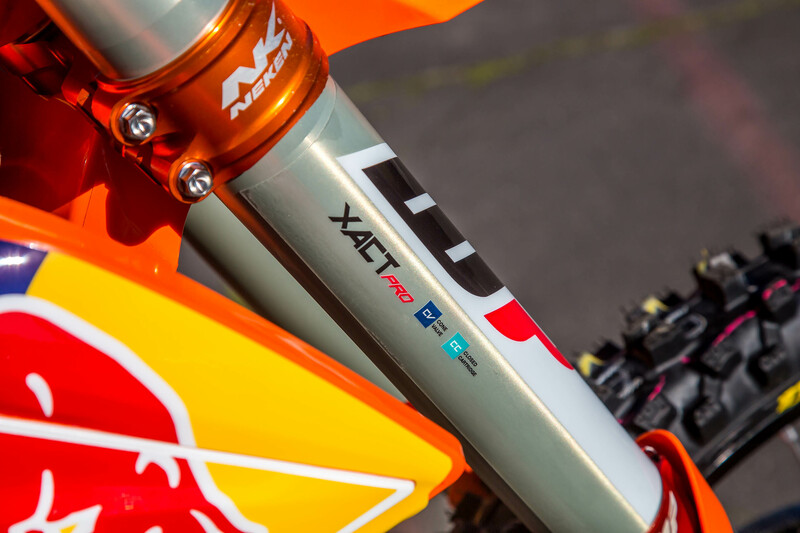 Cooper Webb’s Factory Red Bull KTM 450SXF. At a distance you would believe that under the KTM tents sits some of the most factory bikes in the entire pit area. After talking to Carlos Rivera (Cooper’s Mechanic) we found out that this might be further from the truth than expected. Up front Cooper runs a Renthal Fatbar in a neutral position. The forks were pushed pretty high up in the Neken triple clamps but Carlos explained that will change depending on the track and is all based on a feel preference for Cooper. An OEM throttle cable is used. Like many of the factory teams this year, we found carbon fiber protection pieces on both the clutch and front brake housing. Carlos did tell us that in years past rocks have hit this area and caused problems during the race. Every factory team uses protective pieces like this for peace of mind and some extra insurance during racing. 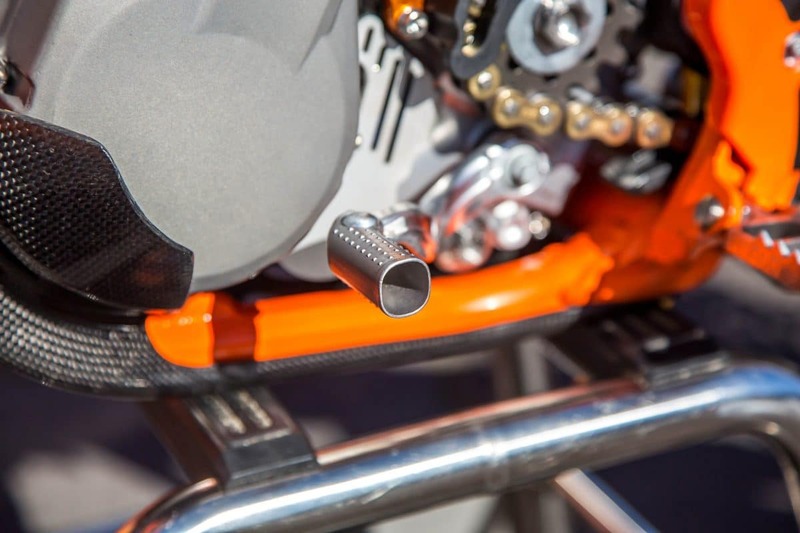 A billet throttle tube and housing is used on Cooper’s bike. This was placed on Cooper’s bike specifically for durability purposes. It is the identical tube just a bit stronger than stock to withstand race conditions. 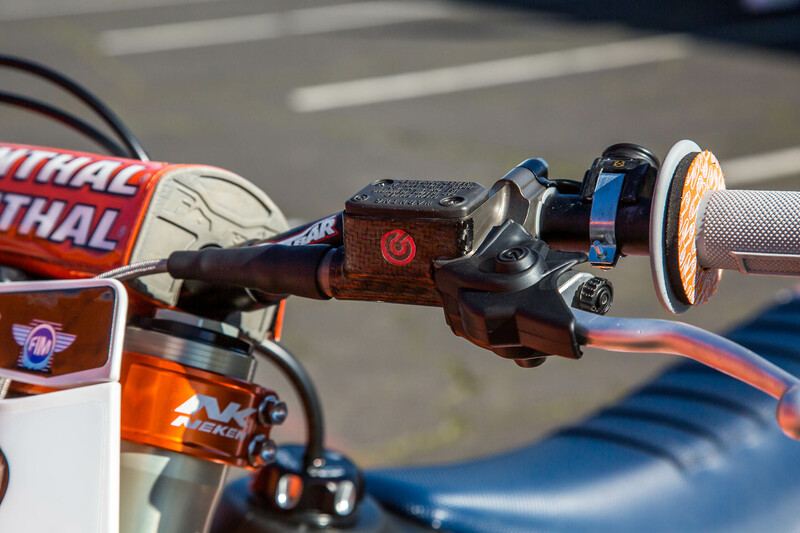 The cable itself is stock and you even find some KTM Power Parts on the front brake perch. 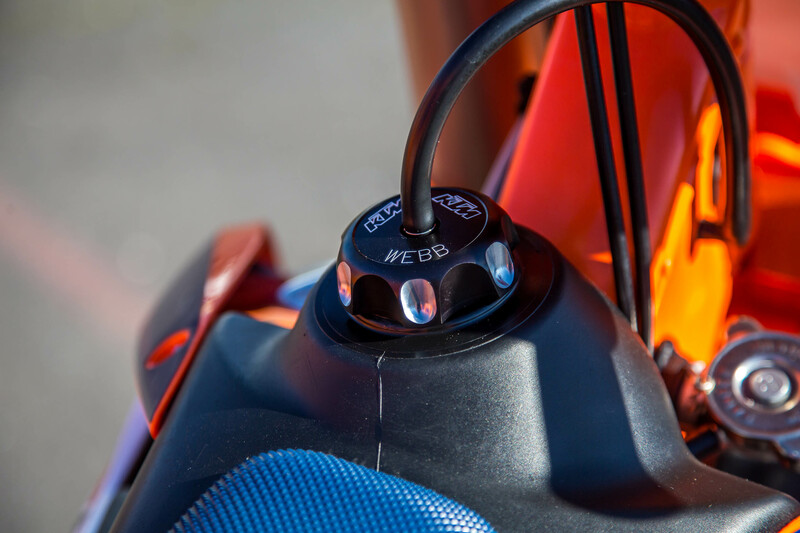 One thing we did notice missing from the handlebars was the map switch you find on a 2019 KTM 450SXF. There was the start switch and kill switched mounted next to the clutch. Cooper is running Renthal half waffle grips with grip donuts. Carlos explained that Cooper has run grip donuts since he was a rookie and prefers to keep them on. Marvin Musquin does not run these on his bike. 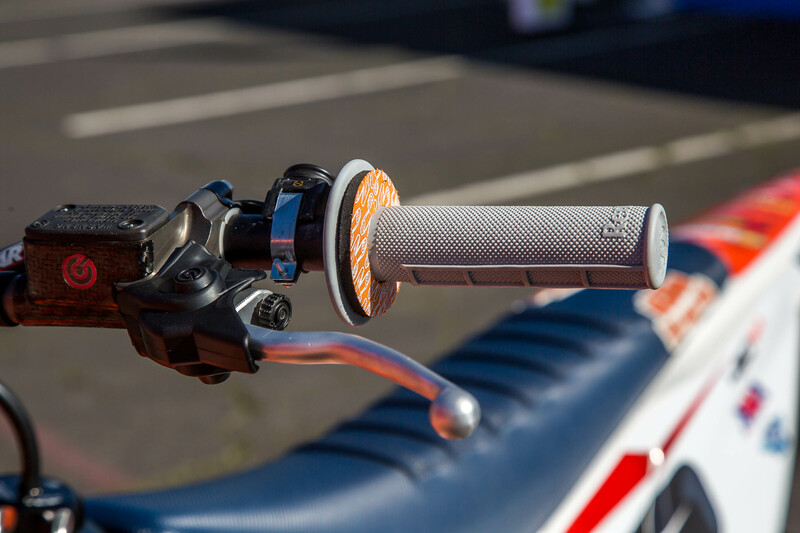 You can see here how far pushed in the clutch lever is from the end of the handlebars. This does 2 things. 1, it prevents the lever from being hit or catching a rut when racing, and 2 it is where Cooper prefers to pull it in at. A billet clutch lever and front brake lever are added to Coop’s bike. They have the same ratio as stock just in place for durability. His positioning on both the front brake and clutch lever are very neutral. Carlos said that he will sometimes lower the levers a tad before going out but for the most part he is in a standard position. 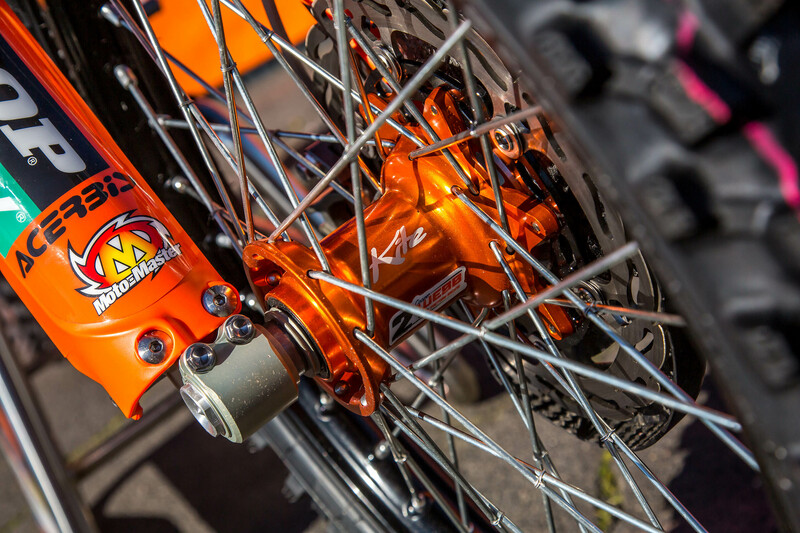 Attached to the anodized orange Neken triple clamps are a set of WP Xact Pro 52mm forks. This is a Cone Valve closed cartridge fork. 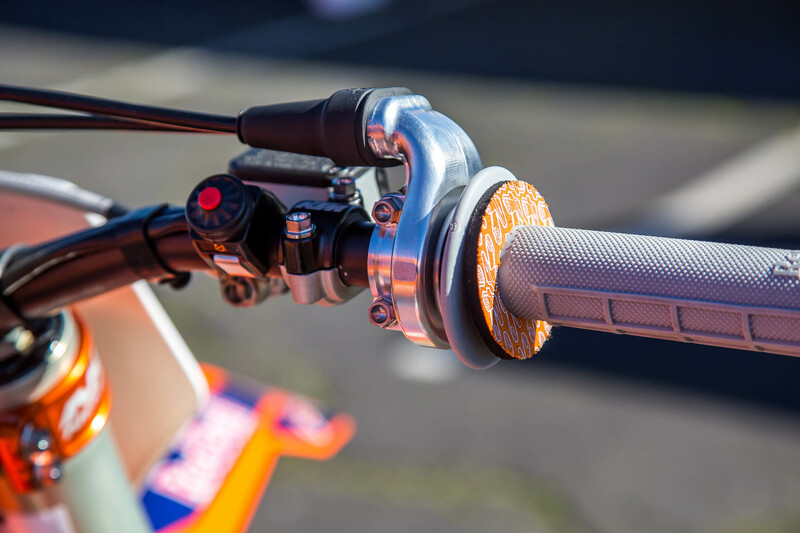 The KTM has been using a 52mm set up since 2010. Carlos explained that every year there is an improvement over the last and new parts are constantly being made. Cooper’s Kite start device is in a very standard position and only offers one button. The forks have an integrated ring built into them for the start device to make it a lot cleaner compared some of the other set ups out there. A titanium Mettec axle holds the front wheel into place featuring KITE hubs and DID rims. Mettec builds on request for the team these axles and to their specifications. If you look closely you can see that each spoke is fastened with wire for a little extra insurance. 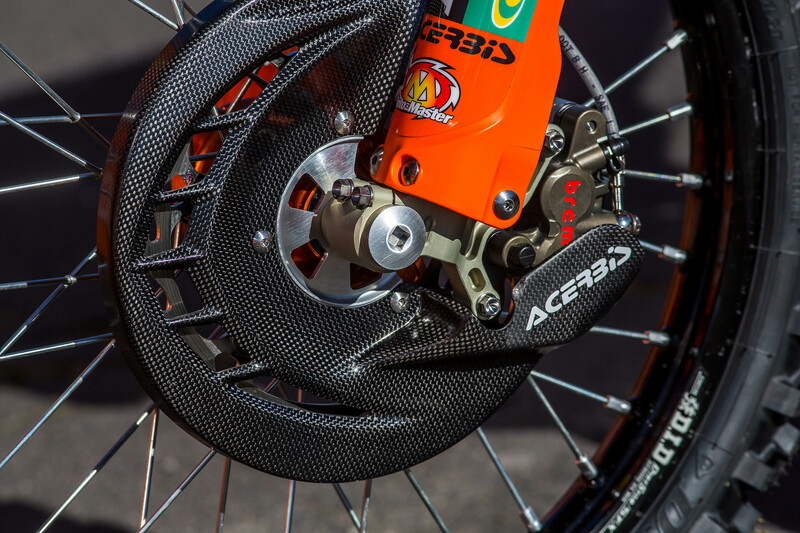 The front rotor guard is supplied to the team by Acerbis. The Moto Master front rotor is a production size 260mm. The Brembo caliper is a larger piston caliper for more power with a stock brake line. OEM radiators are mounted to Cooper’s bike and are polished to give it that factory feel. A 1.8 to 2.0 cap is used on Cooper’s bike. While some of the factory teams have to bump up the size of the cap, KTM oem spec on the radiators is 1.8 starting off. Carlos also explained that their bikes over last year run much cooler. These caps are made for the team to fit their euro style gas tank. The tank size is the same as production but with a sleeker look to it that the team likes to have. 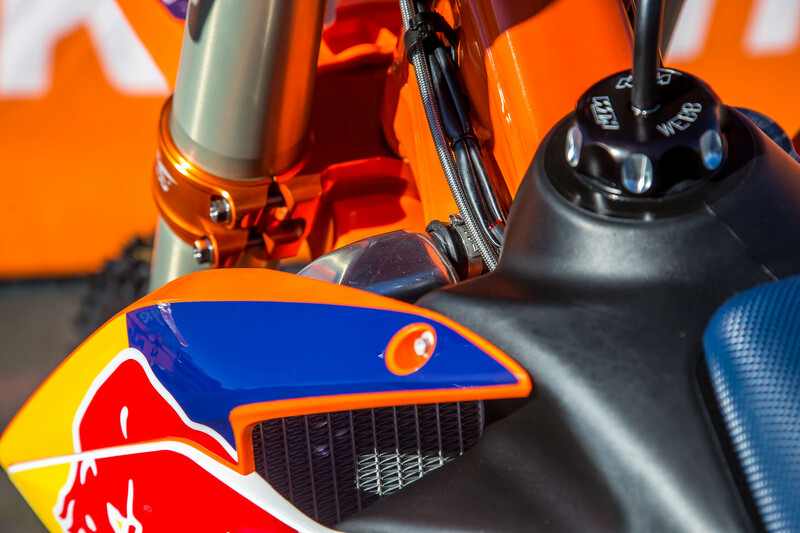 An Akrapovic skid plate is used to protect Cooper Webb’s bike from any debris or damage. Both sides of the skid plate wrap around the frame to protect the ignition covers and clutch clovers. 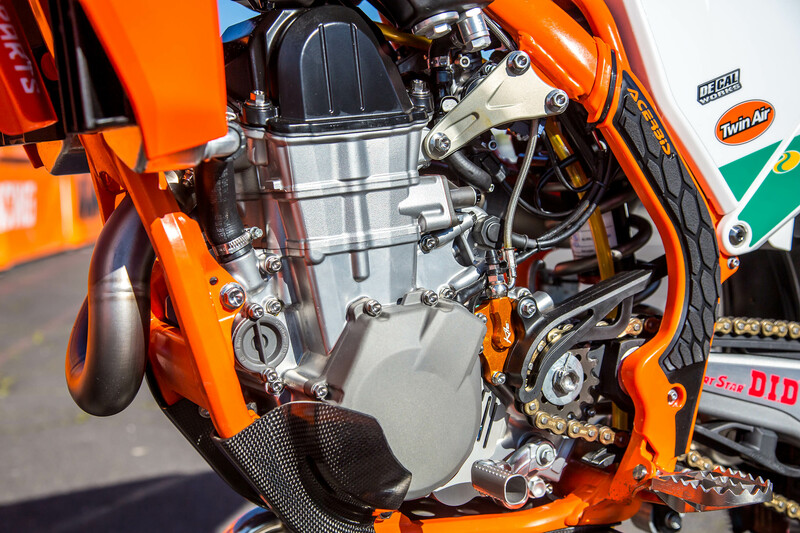 Another angle of Cooper Webb’s race engine. You can see the cerakote on several pieces. This is to strengthen the parts in the event of an impact from debris or other bikes on the track. The chain moves a lot around that area as well so it is very likely something could get kick up at the cases during racing. The Kite clutch slave cylinder is made out of billet and a bit stronger than stock. 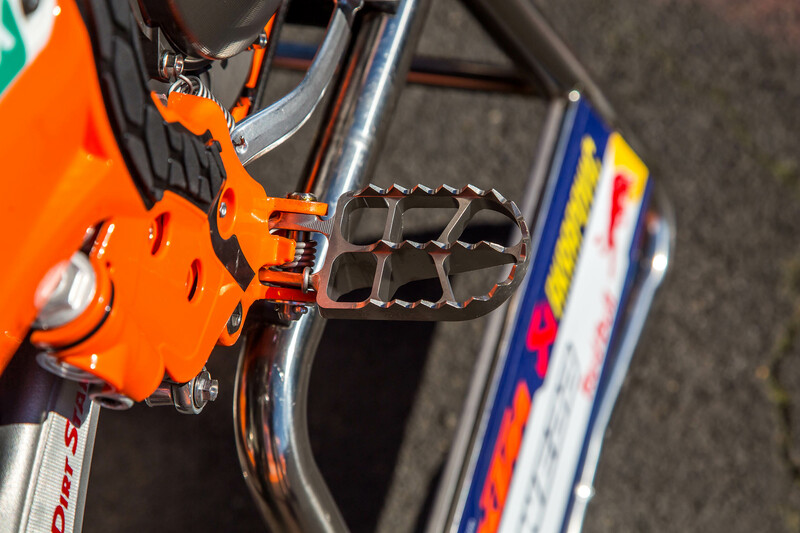 The chain sliders and front guide are the same that would will find on the 2019 KTM 450SXF. A stock shifter is used with no change in position or length. They also do not run titanium bolts on this piece of the motorcycle. They prefer to use steel bolts for the shifter. Nihilo concepts custom makes these billet titanium foot pegs for the team that are made from one piece. Before the season started Cooper Webb was running production frame guards on his bike while Marvin did not. 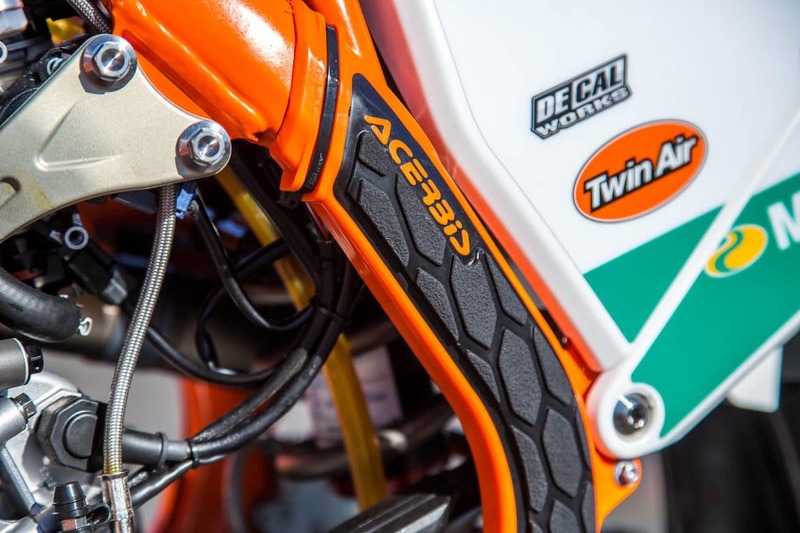 During the mud race opener at Angel Stadium in Anaheim Cooper went to these Acerbis guards that are better in wet conditions/mud for gripping the bike. Cooper then wanted to try them in dry conditions at the track and stuck with his decision. He feels like he can grip the bike better and overall they have a better feel. Twin Air air filters supplies the team with all their filters. 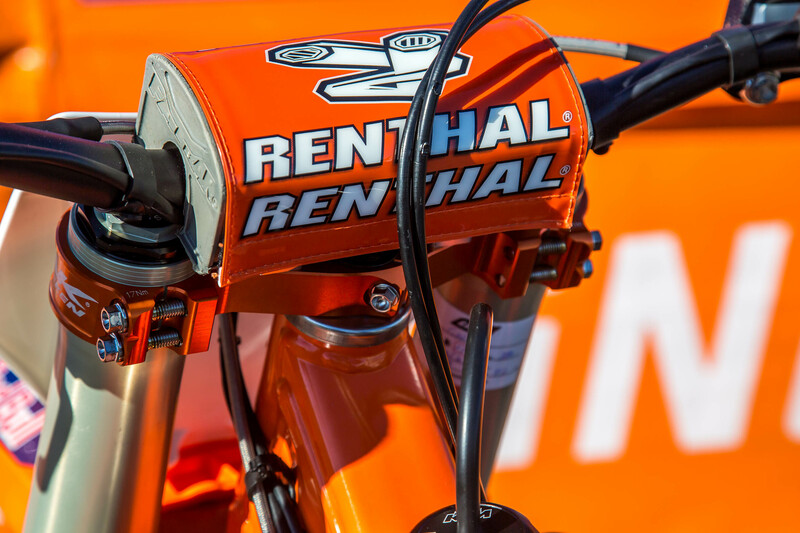 They have options to run a Supercross filter or outdoor filter if they want to but no major changes are done to the air filter on the bike compared to an OEM version. This is a new version of the WP rear shock. It is more compliant and fades less during the outdoor season. You can see the amount of adjustment the team has on the shock body to get it just right for Cooper during the day. A strong DID chain and Renthal sprockets are added to the motorcycle. In the off season the team will test multiple gear combinations to find a good setting. Carlos talked about the 2 stroke era and how they used to change in between practices and even racing but with the 4 strokes and how strong the engines are they can pretty much keep to 1 gearing combination all year long. There is a black cap on the end of the titanium axle to protect it and a closed nut on the other side so dirt doesn’t get trapped inside. This also prevents from the treads being bent on impact and the removal of the rear wheel becoming more difficult to get off.The bottom chain guide is designed by Roger and made by Akrapovic. The design protects more of the rear sprocket and helps with alignment to have the chain centered at all times. You can see the capped aluminum nut on the titanium rear axle to keep mud out and to protect the threads. A Moto Master rear rotor and works Brembo rear caliper is used. The axle blocks are made in house and designed by Roger DeCoster. As far as axle position this is where Cooper feels it is most comfortable. They have tried forward, back, and middle to see what he might like more. Carlos explained that one of the best things on the motorcycle is the Akrapovic exhaust. He explained how top class the quality and performance is of the his exhaust. He said that the exhaust is tailored for their engine package which makes great power and extremely quiet. They never have a problem passing sound with these exhaust systems on their motorcycles. Another look at the rear shock and a glance at the factory Brembo rear master cylinder. What makes it factory is the removal of the site glass you find on an oem bike. The site glass is removed to prevent debris or motorcycles cracking it open and brake failure to occur. 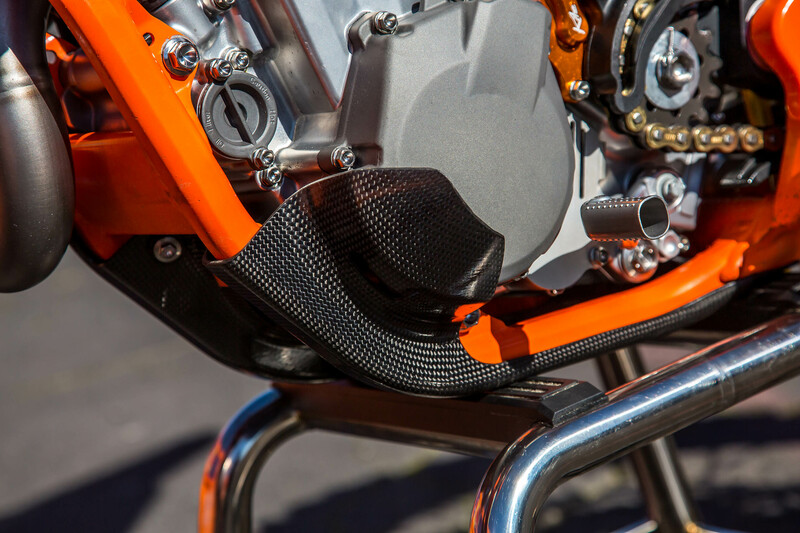 Hinson clutches are used on Cooper’s bike. He has no preference in a stiffer clutch spring or engagement preference beyond stock.Carlos said that Cooper is very very easy on the clutch. You can also see in this photo the site glass for the oil is protected. Just a small sliver is cut out to see the oil. This is to protect from the glass being cracked or damaged during racing. Motorex oil is used inside the engine. 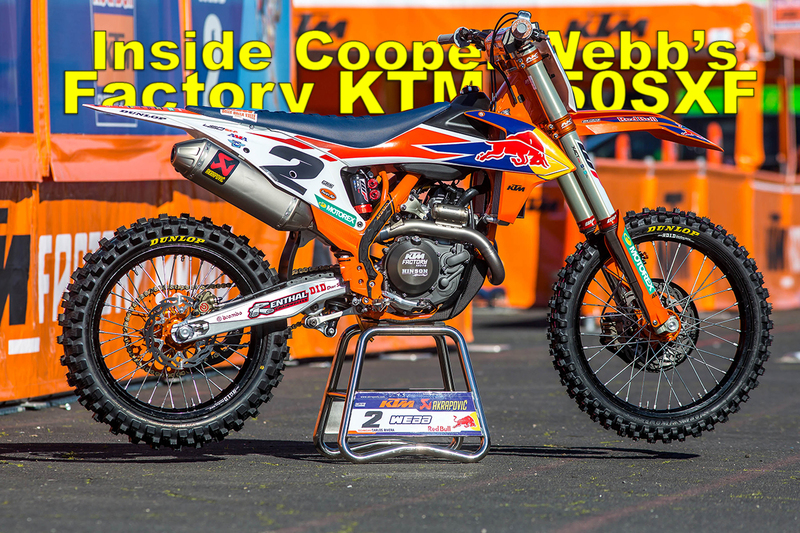 A cool note that Carlos made was that Marvin Musquin prefers a less powerful engine package than Cooper. You can see the OEM brake pedal and tip that are used on Cooper’s bike. A brake snake is also attached to prevent from banners or debris getting caught into that area. The tip is also protected from being bent in during a collision. Carlos brought up the time Dungey had to shift with his hand in Las Vegas because of a damaged component. These types of preventative measures are there to ensure the rider can use his brakes and shifter all the way through the race. In Ryan’s instance, there was no snake on the shifter and nearly impossible to place on that side of the bike. Sped Dunlop front and rear tires are used on the bike. Some riders are using a 110 this year in Supercross which is narrower. Cooper Webb is still running the 120. There aren’t a lot of changes with tires. Once he finds a few that he likes that is what he will stick with. All around the motorcycle you will find aluminum and titanium fasteners. All the titanium is supplied to the team by Mettech. Because this is one of the lightest bikes on the 450 class they are just finding a way to bring weight down but also strengthen parts of the bike as well. Carlos explained that this could be the most stock bike in the pits. Most of the parts you could almost buy and ride the same bike as Cooper Webb. Besides the final touches and specs for each rider this is extremely similar to the 2019 model. While other factory teams are running different material for their engine hangars, KTM is using the aluminum hangars that come on the motorcycle. 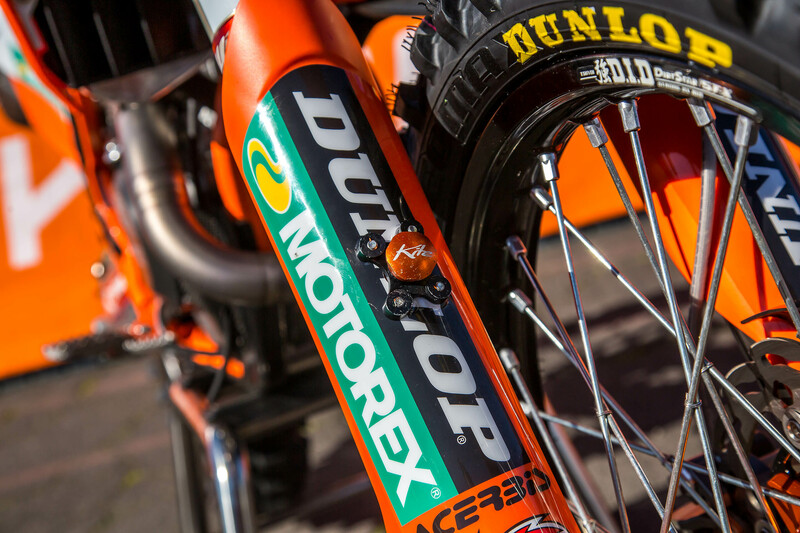 We have seen on the Rocky Mountain KTM team that they will use a different material on their bikes. DeCal works supplies the graphics to the team and works with them to supply material that is light weight and durable for racing. Cooper prefers to have the seat pretty fresh but they are broken in. They don’t want the stiffness that you might get from a brand new seat. 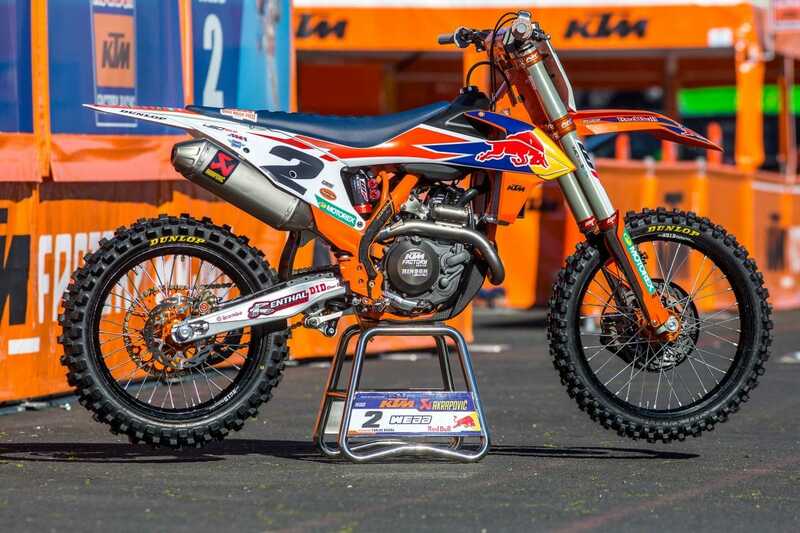 The seat cover is more aggressive than Marvin Musquin’s seat. They both have ribs but Cooper does have way more grip on the sides and around the entire seat area. Just behind the front number plate is a special bracket the team makes for the transponder to sit in. Carlos explained with the design of the front number plate there is ample room for a bracket and easier way to mount the transponder for racing. Between the teammates there isn’t much of a difference. Carlos explained that both Cooper Webb and Marvin Musquin could jump on each others motorcycle and race them without changing much.